The Sydney Opera House is a beautiful structure known throughout the world as one of Australia’s most famous landmarks and is one of the most visited sites in Australia. 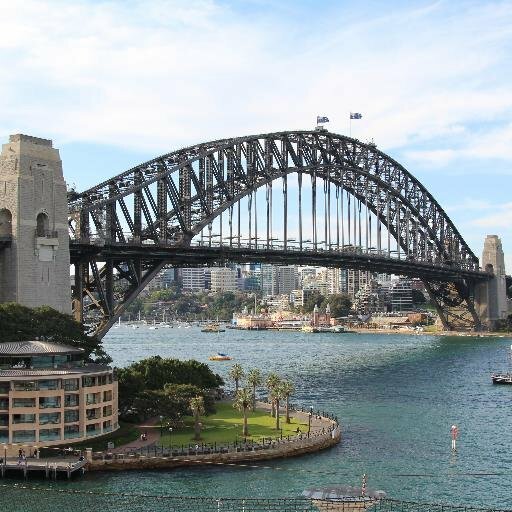 It is what most people look forward to seeing when they visit Sydney. 1. The Sydney Opera House is built on Bennelong point in Sydney Harbour (originally the site of Fort Macquarie). In 1902 the fort was demolished and replaced by a tram depot which operated until 1955. 2. When the government of NSW decided to build the Opera House, a contest was held to pick the design of the building. Danish Architect Jorn Utzon won the contest with this design. 3. Even though the roof sails look like one piece…they are actually made of cast cement ribs which hold interlocking chevrons that hold the one million, fifty-six thousand, six individual ceramic roof tiles from Sweden that cover the entire Opera House. Due to the vast number, the tiles were fitted on the ground and then lifted by a huge crane to position and lock into place. 4. The Sydney Opera House is one of the most popular performing arts venue in the world and covers 45 acres of land. 5. The construction of the Opera House took 14 years and cost more than 102 million dollars. Construction started in 1959 and was completed in October 1973. 7. The Sydney Opera House conducts almost 3000 events each year and has an annual audience of 2 million for its performances. 8. The Sydney Opera House was made a Unesco world heritage site on 28th June 2007. It’s not just opera they do here, it’s rock concerts, films, talks, cabaret a little bit of something for everyone. 10. Vivid Sydney hosts it’s annual event that attracts people from all over Australia and the world to witness this spectacular event. It takes place around May each year. During The Sydney Vivid Festival it really takes on a life of its own. The light show make this gorgeous building mesmerizing and is a definite must see. Sydney Opera House – the star of the show. Arrive early to secure a good spot for taking photos and watch the sails on the Opera House change from butterflies to snake skin , to moving birds and amazing Aboriginal artworks. Enjoy the Vivid Sydney festival as the Sydney Opera House comes to life with its fascinating illuminations and major artworks displayed on the sails. Enjoying great views from the Opera bar. Other great viewing areas for the Sydney Opera House are in front of Customs House on the other side of Circular Quay. Click here to find out more information about Vivid Sydney.